This manuscript of 200 folios contains 150 psalms and other liturgical texts. 24 pages are illuminated with miniatures, generally two scenes, one above the other. The manuscript was commissioned for Ingeborg of Denmark, who became Queen of France through her marriage to Philip II (reigned 1180-1223). It was perhaps produced at the Cistercian nunnery of Fervaques near Saint Quentin. The miniatures in the Ingeborg Psalter are distinguished from earlier Romanesque works by innovative stylistic features and were a major influence on later Gothic illumination. 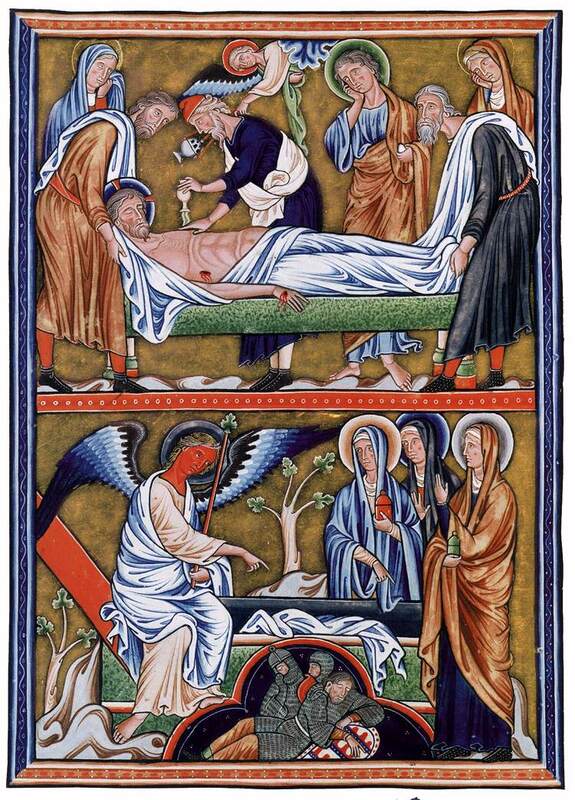 The entombment of Christ at the top of this illustrated page is staged like a liturgical ceremony – the angel swinging the censer is the element which raises the image to the level of a ritual act. The scene at the bottom is set out along more conventional lines. It shows the three women at Christ’s tomb, with the angel telling them that the Lord has risen. The three sleeping guards appear within a trefoil shape, a detail which shows that contemporary stained glass served as one of the models for this image.